That's what the Advanced Settings tab is all about. 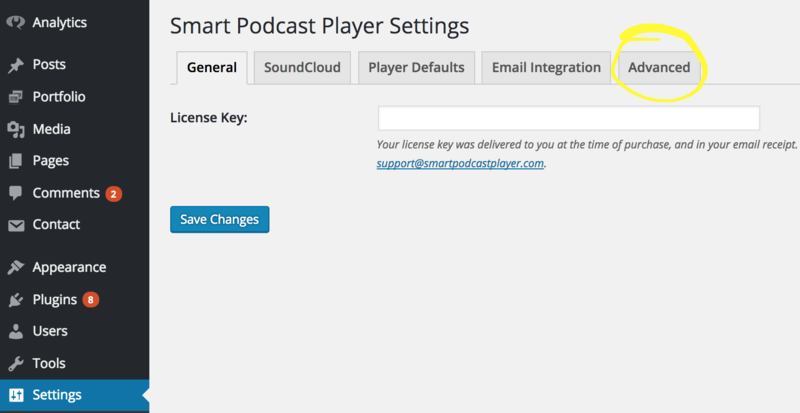 It's a collection of technical updates and enhancements we've made over the years to ensure that your Smart Podcast Player experience is up-to-date and runs as smoothly for you, on your unique WordPress platform, as possible. For most users, you will be able to leave the settings as-is; however, read on if you are experiencing any of these problems. So, without further ado, here's a walkthrough of each of the categories listed in the Advanced Settings tab. If you have updated a podcast file or track information in your podcast host. Note that this only clears Smart Podcast Player data. Your site may have a page cache or other caching systems in addition to this. This button has no effect on other caches. What This Does: Sets which part of your RSS feed is used for the show notes portion of the player (This is the text that appears below the player controls and, upon expanding, on the right in the full Smart Podcast Player.) Not all RSS feeds have all these options; look at your own feed to see which is best. When changing this option, clear your SPP cache afterward. What This Does: The SPP cache is automatically cleared at this interval (from 5 to 60 minutes). We recommend 15 minutes. 15 minutes is a nice balance—new episodes will appear on your site quickly without causing performance problems. Note: When you make a change to the cache timeout setting, it may take up to 60 minutes for the previously cached items to expire. If you'd like any changes to take effect immediately, click the clear SPP Cache. What This Does: For the Smart Track Player, when the artist and title are not specified in the shortcode, SPP can look in either your RSS feed or the ID3 tag of the MP3 file itself. This option specifies the order in which they will be used (if the data isn't present in the first location, SPP falls back to the second). The default setting is: RSS feed, then MP3 metadata. What This Does: This is a tricky one. It has to do with the download button on the players. Sometimes Automatic (which is the recommended setting), or sometimes Stream (fopen), or sometimes Local File Cache works best on some servers than others. Try it first at Automatic, and if there's anything funky going on with downloading, try one of the other two options. Automatic (recommended): This option balances loading speed with the amount of memory required. Try this option first if you are experiencing problems downloading your podcasts. Stream (fopen): This provides the fastest loading speed; however, larger podcast files may fail to load. This is the default method used to load all files in Versions 0.9.3 and earlier. Local File Cache: This is the slowest, least memory-intensive method. If your podcast tracks fail to load using both methods above, try this setting. What This Does: With this set to Yes, SPP will be more assertive about overriding your theme's styles (font sizes and so forth) within the player. Usually this is a good setting to look at if there's anything that looks off in the styles of your player. Here's a handy tool that can help you find the hex code for a particular color. What This Does: This uses an alternate method for getting our JS and CSS files onto the page. We strongly recommend you stick with No (Recommended) as your option. Where is the Smart Podcast Player's Settings Menu?